Service management solutions have the potential to return very significant hard-currency ROI. Successful implementations dramatically improve decision accuracy, enhance productivity, increase operating efficiency and reduce operational risk by providing comprehensive context for a wide range of management decisions. But these solutions cannot operate to their full potential in isolation; they require multilayer integration with the underlying IT infrastructure- the existing system and network management tools, key business applications and personal productivity tools. 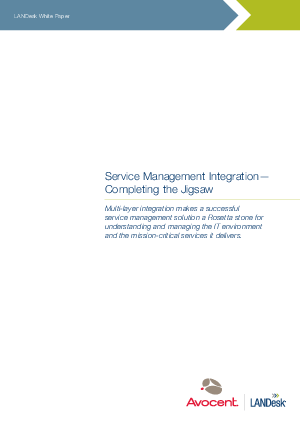 With comprehensive integration into this environment, service management enhances the collective functionality and business value of existing management resources, as though under its influence the solution becomes greater than the sum of its parts. This paper examines the relationship between out-of-the box integration support and the ultimate functional utility and value of service management investments.